These Gooey Buns are our favorite treat when we venture out to a local Le Peep Restaurant. So easy to make at home…bet you’ll love them too! I don’t eat out often; it’s just not my thing, much preferring to throw something simple together at home than pick up food to go. But it’s funny that food blogging has really changed that; not only am I invited to visit restaurants locally to check them out but I’ll tell you, ever since I moved almost 5 years ago; I’ve given myself a break occasionally. It’s probably taken all of these five years (how can that possibly BE?) to get settled. Certainly having to start over with a yard was a big part of it, but I’m just doing some finishing up touches this weekend on both my bedroom and my office; no more just scraps of stuff thrown together from everywhere else. Maybe I should have moved more often so the job would have been easier but here I am. Luckily I’m not a pack-rat at all but 22 years in one home and I had a LOT of stuff. Inventory from a business I shut down after an injury before I moved (yes, I have GOT to do something about that); girls grown and gone but I’m still holding onto furniture, dolls and school projects for them. I downsized when I moved and my daughter took my Grandma’s first dining hutch but I still have the table, chairs and a small telephone table I’m keeping in the basement to insure they don’t leave the family. Needless to say cooking often took a backseat during that transition and I occasionally had a bright moment that re-introduced me to a place I had pretty much forgotten. One of those places was Le Peep Restaurant, a place I took my girls too often after church on Sunday but I hadn’t visited in many years. I thought they were a nationwide chain but only recently discovered that Le Peep is just found in scattered states. Now that we’ve been re-introduced, it’s a favorite place to meet friends for a morning rendezvous and I simply love the breakfast offerings. One of my favorites? These Gooey Buns. If you don’t have a Le Peep in your area, know that while they might call them Gooey Buns they’re really Gooey Muffins. 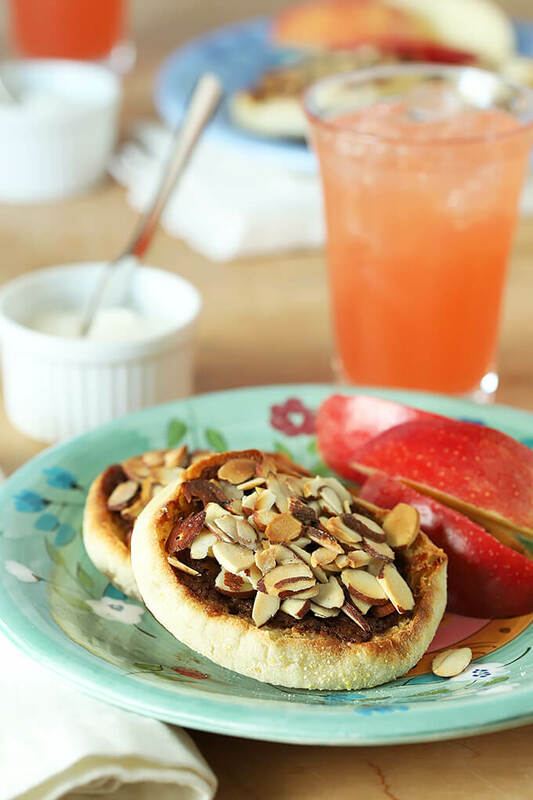 An English muffin is topped with a cinnamon and sugar butter mixture that is broiled and then topped with slivered almonds for the last couple of minutes. 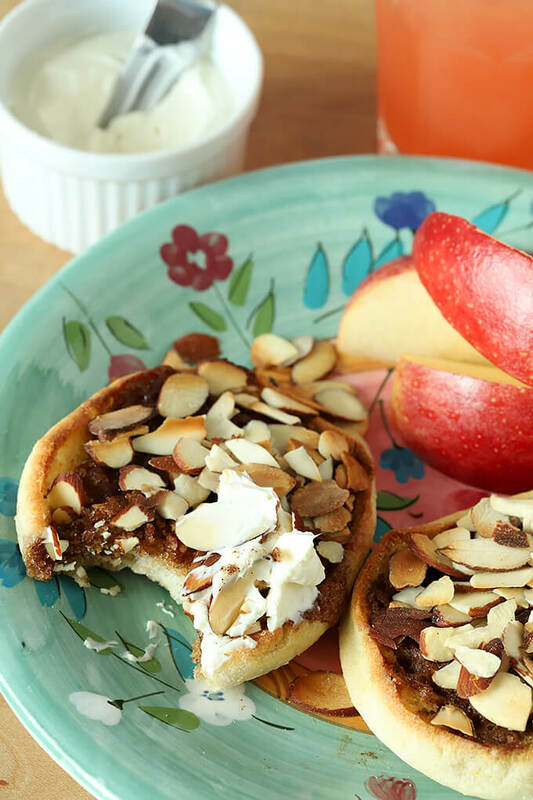 Served with some sweetened and cooked apples (they call them ‘Sassy’ Apples) and cream cheese on the side, I think they’re the perfect breakfast treat with a nice mixture of both sweet, spicy and a bit of tang from the cream cheese. I didn’t make the apples this past weekend but if you want to; it’s simple. Just combine some apple slices with a bit of butter and sugar and cook on the stop until they soften…maybe I’ll blog about those next! I actually did a post about these before I moved here but in all honestly I was sort of at my wits end living in someone else home and it showed; the photos alone were simply horrid. 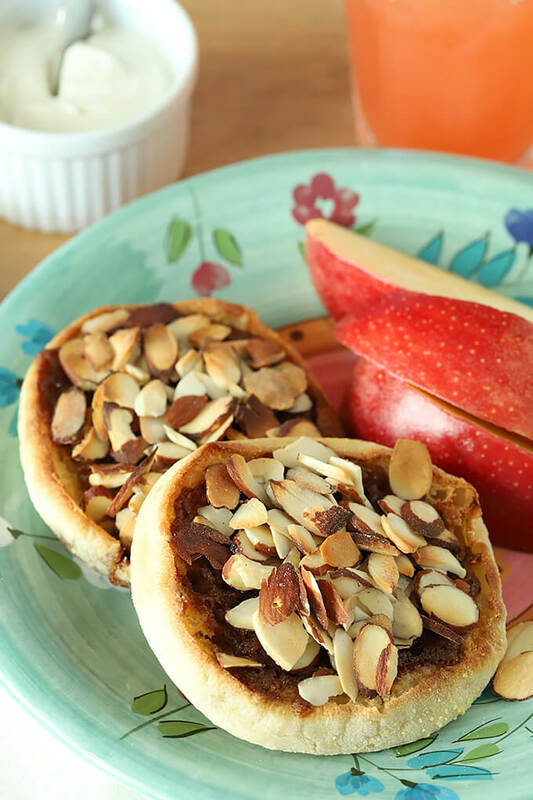 I’m glad I tried making these again; they are the perfect warm treat for a quick but delicious breakfast and one more reason to stay home and make something in my own kitchen! I know you’ll love them too! Combine the apples, butter and cinnamon in a small pan on medium heat; cook until the apple chunks have started to soften; approximately 15 minutes. Combine the cinnamon and sugar and mix both with the softened butter. Spread this mixture on each muffin half; yes, be generous! Place cookie sheet on the middle rack in your oven and broil for about 2 minutes watching closely. 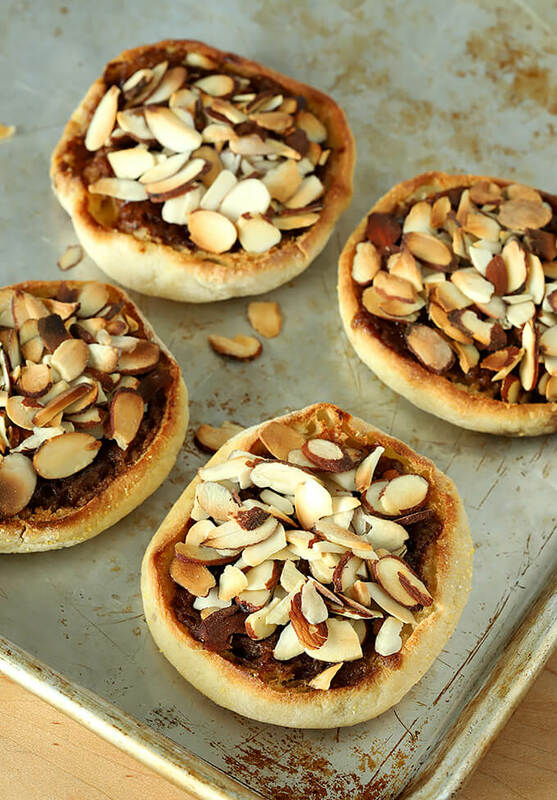 Remove from oven and sprinkle with the slivered almonds. Place them back under the broiler to toast the almonds; watch CLOSELY; should take about a minute to brown the almonds. Serve with plain cream cheese and 'Sassy' apples on the side. Good to see this one reappear! Such a good recipe, Wow, just putting the finishing touches on your new house after 5 years? That’s a long time, of course, but I’ll bet you’ve had a lot of pleasure along the way. Plus, at least for me, I have to live in a place for some time before I have any idea what I want/need to do. Bet you own’t want to move again for years and years! I had to give away my office furniture when I moved; no room to store it and the table worked but one day it just didn’t. I’ll show some photos soon when I’m done…and then this winter it’s on to the basement! Oh my goodness these are the most on point gooey buns!! I used to work at Le Peep and I feel like I’m back there again. Thank you for the recipe so I can enjoy them at home! Thanks so much for letting me know Mandy. It is so funny…I just noticed them the other day and thought they desperately need a new photo. Soon, very soon! I’ve been to Le Peep, but I’ve yet to try these delicious buns! They look outstanding! Like you, I don’t eat out very often, and I love recreating recipes at home. Thank you for sharing this with us. Too good! I’m all about these gooey buns. All about em! These are utterly brilliant Barb – sometimes cinnamon rolls or sticky buns are just too much for me in the morning but these look just right! Glad you are “bunking” in with some friends – I know it will seem strange but it sounds perfect for you right now… hope all is well!!! 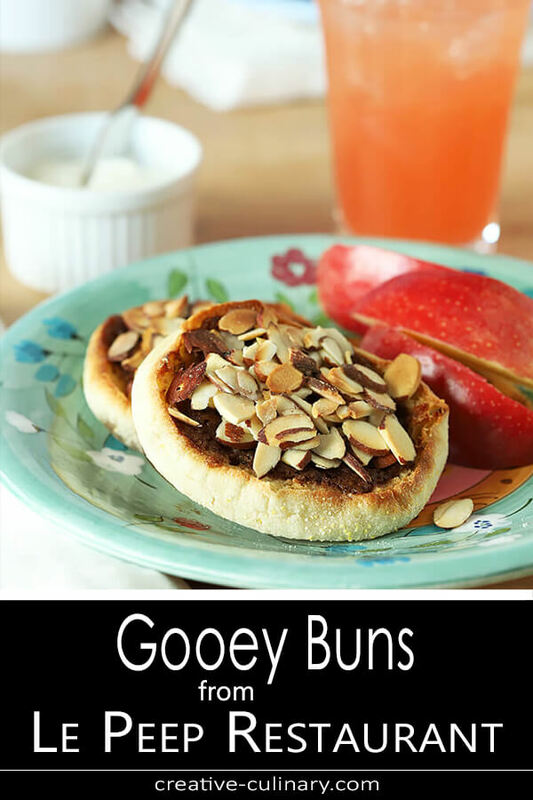 These buns look irresistible, I love the side of apples! I hope your move goes well! These look really tasty, the apples are so good this time of year too. Moving is such a pain! Although it gives you an opportunity to get rid of stuff. The longest we’ve ever lived in one house is 11 years. Every time we’ve moved we’ve given away or thrown away quite a bit. But we still have too much! So I sure can understand your pain. We’ve always packed our own boxes, so I’ve gotten pretty good at packing dishes and kitchen stuff – something that in the past could take a couple of days because we had so much). Anyway, good luck with things. We don’t have Le Peep, but those gooey buns really look delish. Thanks for recreating the dish for us! Wow, I’ve never had these at Le Peep and now I am really wondering why. They look outstanding and so easy. I’ll be trying these soon. Good luck with the move. things always have a way of working out and how nice to be with friends. It’s been a longtime since I’ve eaten at Le Peep but when I do, I get these. I’ve recreated them, too and once i sent my kids out the door with them. In that case one of them ended up with a burnt mouth! So i learned to wait until they cool! I’ve never heard of “Le Peep,” but I’m so glad you have one nearby so that you could share this wonderful recipe with all of us! What a simple, delicious recipe this is. I think all I’d need alongside is a good, strong cup of coffee. I’m hoping the moving/relocating is going well. With everything you have going on right now, it’s completely amazing that you have time to blog! Unfortunately, i don’t have one here… but thankfully I have this amazing recipe to work with! What a way to start the day! Thanks for sharing this recipe. These gooey muffins are something I would have never thought to make but after seeing your photos I can hardly wait to try them! Love those apples chunks and cinnamon. Hoping the final stages of this move goes smoothly for you and that you do find some respite at your friend Karen’s for a few months.